Fight fans can look forward to a real stacked up card on August 24. With European Light Heavyweight Champion Juergen Braehmer defending his title (against Stefano Abatangelo) and super-middleweight contender Arthur Abraham (against Willbeforce Shihepo) trying to get in position for another world title shot, the show is already loaded with highlights. Now the Sport- und Kongresshalle Schwerin will also play host to a special heavyweight attraction. Kubrat Pulev (17-0, 9 KO´s) and Tony Thompson (38-3, 26 KO´s) will fight it out in an IBF final eliminator with the winner to challenge for the world title. 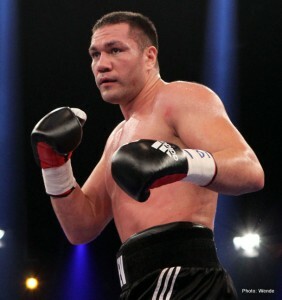 Pulev, maybe the most avoided heavyweight in recent times, cannot wait to step into the ring again. In 2012, the current IBF International and European Champion made it to the top of the rankings, beating Michael Sprott, Alexander Dimitrenko as well as Alexander Ustinov – all of them inside the distance. But as fighters like Tomasz Adamek, Tyson Fury and Ruslan Chagaev refused to be matched with the 32-year-old Bulgarian, his career came to a brief halt at the start of 2013. Tickets for the big fight night at the Sport- und Kongresshalle Schwerin, Germany are available at www.eventim.de.